Crisp texture, lots of pecans, not too sweet. Crunchy texture, lots of pecans, not too sweet. Crunchy texture with almonds and pecans, low glycemic index, not too sweet. 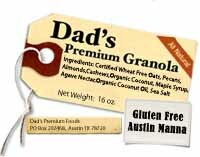 Made with certified gluten free oats with a crunchy texture, low glycemic index and not too sweet. Made with certified gluten free oats with a crunchy texture, low glycemic index, and not too sweet.